CANCELLED: Sadly there has been a death in our Guest Chef’s extended family. We hope to reschedule soon. 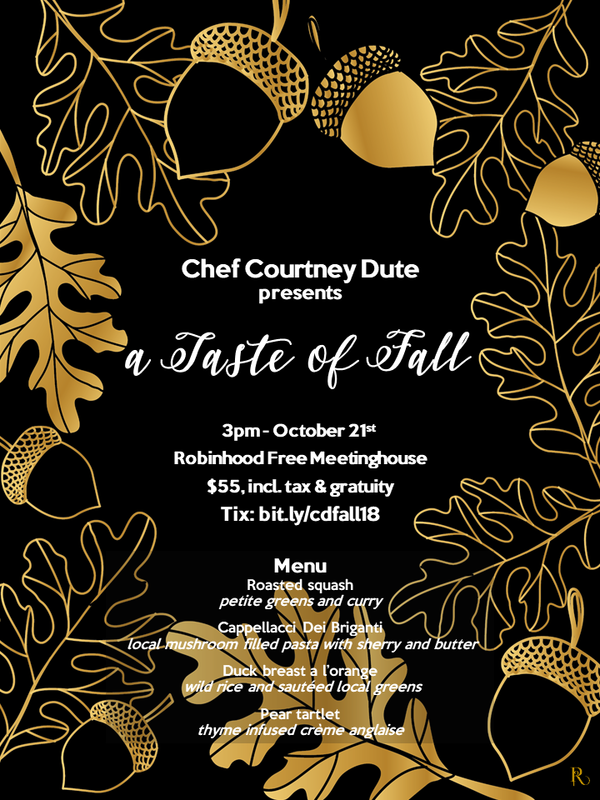 Guest chef Courtney Dute rejoins us for A Taste of Fall – A four course meal inspired by the changing of the season with food to warm the soul. Dinner is $55 pp and includes tax and an 18% gratuity. A special selection of wines will be available. About the Chef: Courtney is back in her native Maine after stints in Arizona, Louisiana, and North Carolina. Courtney realized she had a passion for food while helping her mom in the kitchen and her uncle on his farm during the summer growing up. She started her career at the Eastland Park Hotel and then decamped to Arizona for culinary school, Louisiana to explore Creole-style cooking, and finally to Asheville, North Carolina to work at the popular Mediterranean restaurant Rezaz in Biltmore Village.